Despicable Me Minions Tabletop Pinball Just $17.96! Down From $39.99! You are here: Home / Great Deals / Despicable Me Minions Tabletop Pinball Just $17.96! Down From $39.99! Sears has this Despicable Me Minions Tabletop Pinball on sale for $17.96 (Reg. $39.99)! 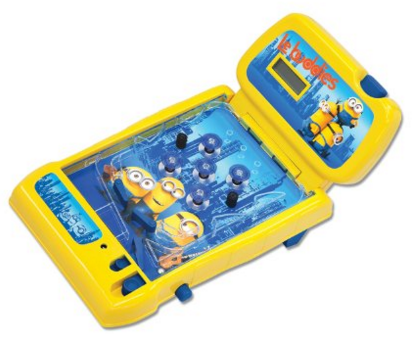 The Minions Tabletop Pinball Game features electronic lights, sound effects and LCD scoring. Launch your ball into action and watch as it ricochets off the bumpers and obstacles. Rack up as many points as you can on the LCD scoreboard. Play alone or challenge your friends to see who will get the highest score.